D.R. Horton’s Southwest Florida Division is pleased to announce a model is now open for viewing in Calusa Park, a new gated community in the seaside town of Nokomis. Five luxurious home plans are available, ranging from 2,587 to 3,609 square feet, three to five bedrooms, and two to three-and-a-half baths. Homes in Calusa Park start at $283,990, and a small number of move-in ready homes are currently available. The professionally decorated Edison model is located at 647 Resolute Way in Nokomis and offers three bedrooms, two baths, a den, and two-car garage. In advance of snowbird season, it’s the perfect time to tour the community, the beautiful new model, and all that the surrounding area has to offer. An excellent location for commuters, residents of Calusa Park also enjoy an easy-going sma ll town lifestyle, with dozens of beaches nearby. Historic downtown Venice is also only minutes away, offering fishing and watersports, shopping, fine and casual dining, and golf. 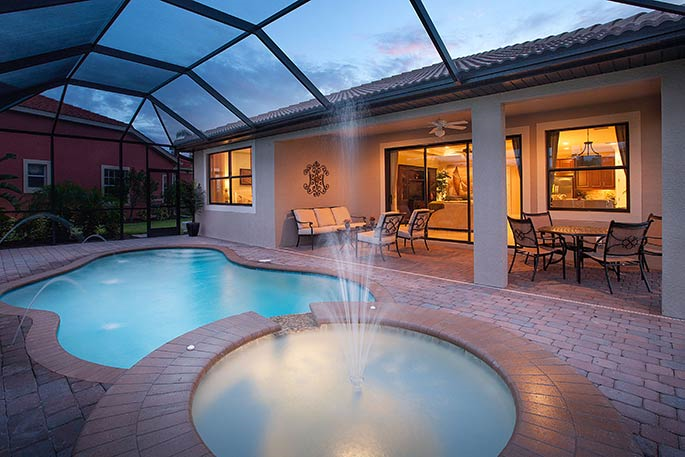 Planned family friendly amenities in Calusa Park include a gated entry, heated designer-style pool, pavilion with covered lounge area, and bathhouse. For more information, call sales representative Joe Correll at (941) 256-5674.